The charming old town of Antigua with its colonial style buildings & cobbled streets is like something straight out of a story book. There is not a building more than 2 stories high & everywhere you look there is colour & culture. 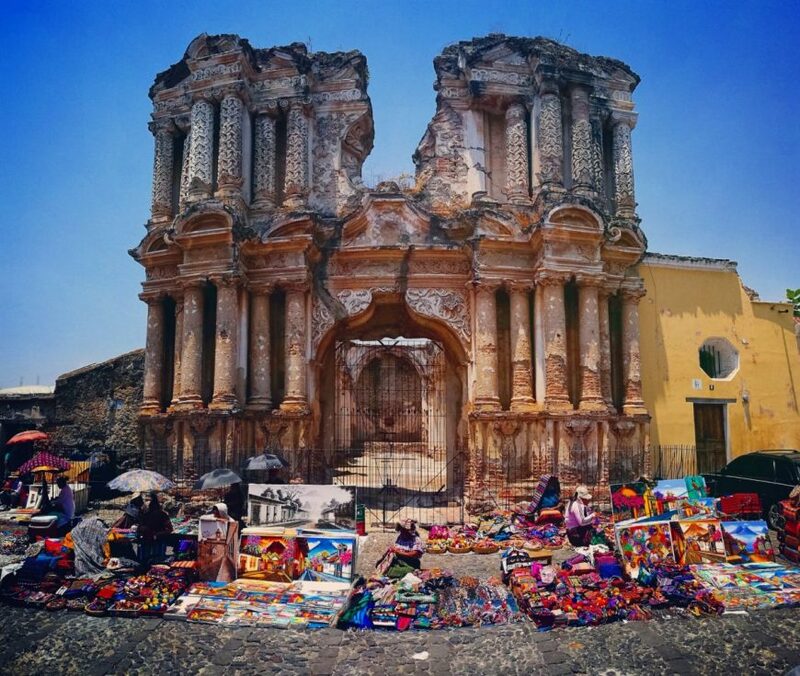 A UNESCO world heritage site, beautifully restored to live up to its title, Antigua is a must on anyone’s Guatemala itinerary. We opted for 5 nights there as we wanted the time to really take everything in, we also chose the week before Semana Senta, the run up to the Easter celebrations with parades already starting & floats & colour alfrombas (carpets) being hand-made throughout town, it was a fascinating time to visit full of excitement & fiesta. 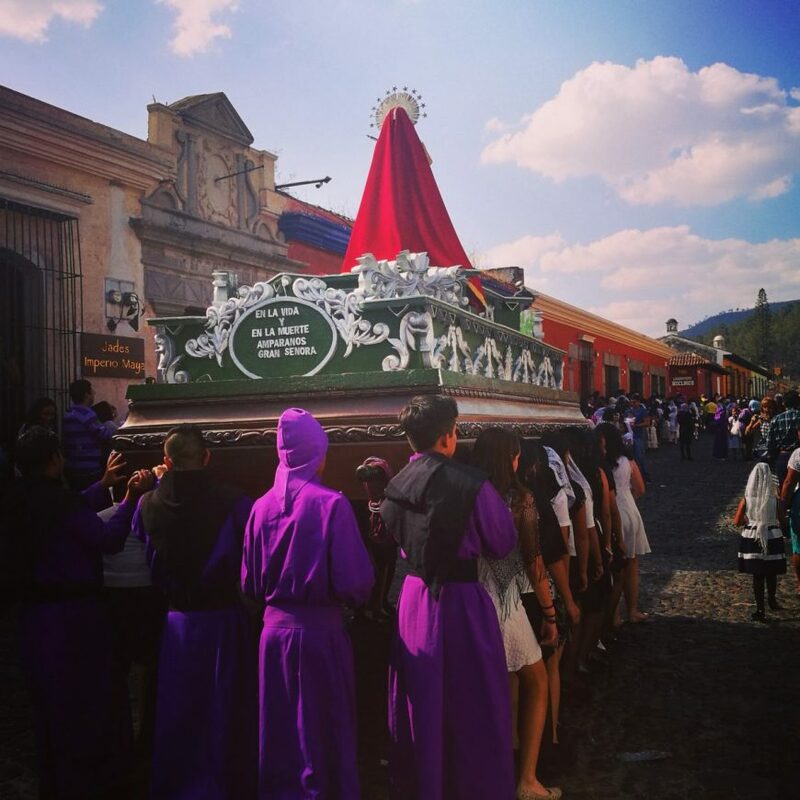 If you can visit during this time we would most definitely recommend to do so, however there are plenty of things to do at any time of year, here are our top Antigua picks….. Note from the author: This article has been written by me from my travel experience. I may recommend & provide links to products & services that I have used & may make commission from such links. This commission helps cover the costs of running this website & will be at no extra cost to you. Anything that I am recommend is from my personal experience & belief that it is worth using. Happy reading! Located just on the other side of “Alameda de Santa Lucia” Antigua’s daily market is full of local produce & cheap products, there are rows & rows of stuff that you could easily spend a few hours wondering around. The biggest gem for us though was an area right at the back which has rows & rows of second-hand clothing. It’s like a giant jumble sale & carrying around the same clothes for 3 months we were ready to add something new to our backpacker attire, I opted for a Levi’s demin jacket & Adam a chunky knit sweater both at just 3 Q each! If you don’t mind second-hand & are after some new get up be sure to pay this market a visit. An incredible hike that starts & ends by minibus in Guatemala, Volcan De Acatenango was for us, not to be missed. It’s a toughie but oh so worth it, we’ll write about the whole experience in full very soon so be sure to subscribe to our blog for full details & pics. If watching an volcano erupt whilst the sun rises with incredible views sounds like your thing, this adventure is definitely for you! Following “1a Avendia Norte” north out-of-town you can get all the way up to Cerro De La Cruz & enjoy beautiful views. The most surprising thing up here is how small the town looks, this may be due to the volcanoes that dominate the landscape with Volcan de Agua creating the most “Instagramabble” backdrop! There are also a couple of vendors up there so if going take a small amount of cash with you, we definitely needed it for an ice slushie after climbing up in the soaring heat but would also recommend bringing your own water. The walk up there takes around 15 – 20 minutes from town, a small hike & a real must-do in Antigua. This cool little bar seems to be the place to hang out, admittedly the drinks are rather expensive but it is a great place to check out for a few hours if only for the atmosphere, all candle lit & jazz filled inside it’s certainly got its own unique vibe. There are also plenty of other bars in town to hang out, a lot of them offering various happy hours so be sure to keep an eye for the best deals! We didn’t stay at this hotel, although we would have loved to if our budget allowed but just visiting it was pretty cool, it’s housed in an old convent which housed followers of the order of Santa Domingo. The hotel stands as an important monument, housing and preserving the treasures from the baroque era of ancestral America. It is beautifully lit up at night with beautiful gardens to explore during the day & we would definitely recommend paying it a visit if beautiful old buildings are your thing! Antigua is the perfect place to explore on foot with lots to see. There’s Plaza Major which is the main hub of the town, dominated by the town’s municipal building. 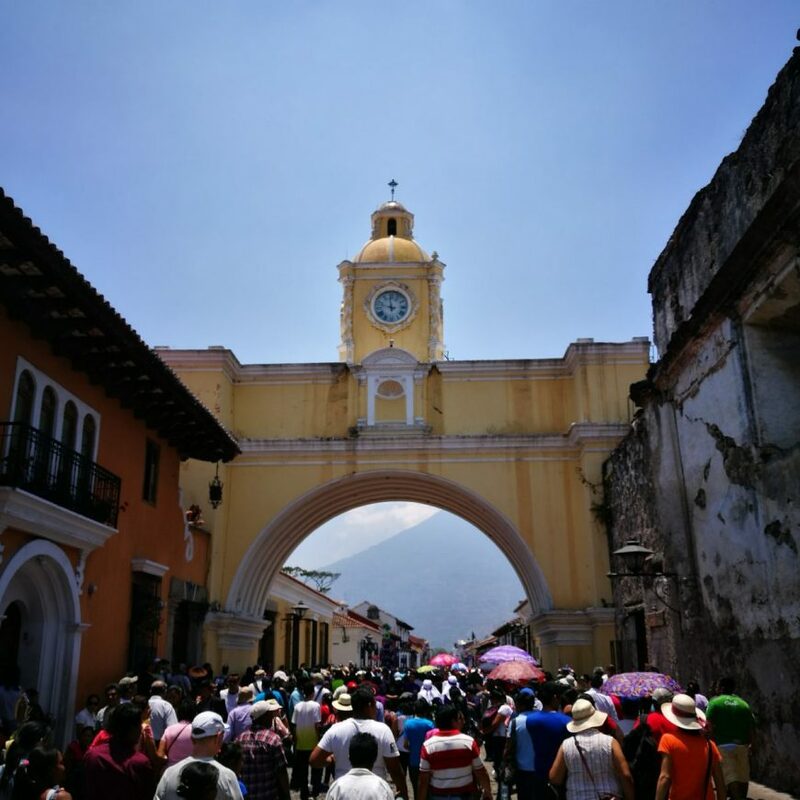 The famous Santa Catalina Arch which is as impressive as it looks in its photographs. 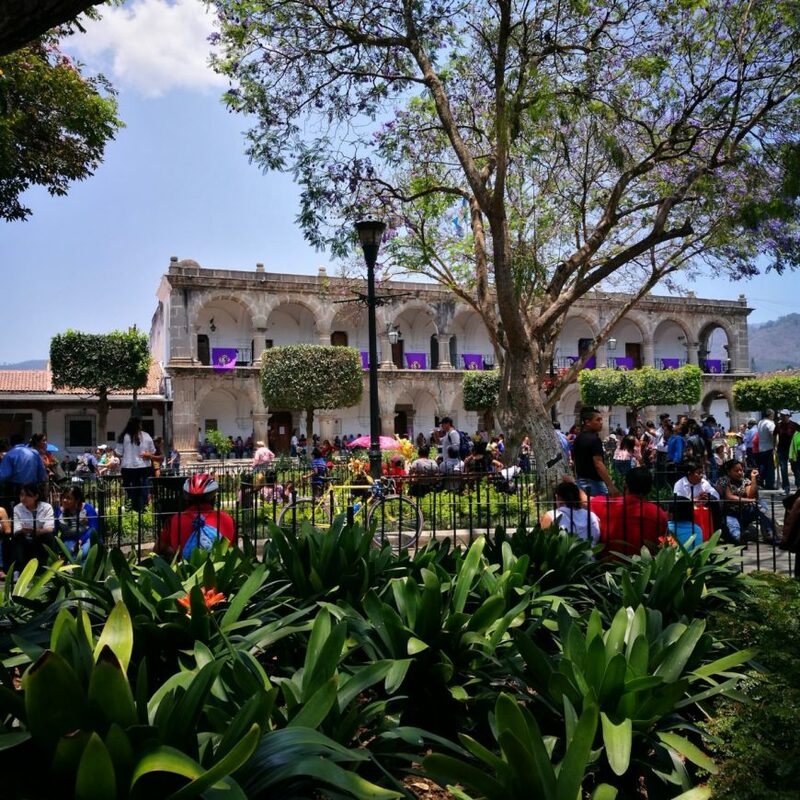 There are countless facades, crumbling old churches, cute little plazas & places to just stop & watch the world go by, we would recommend wandering aimlessly as much as possible, it really is the best way to see things in Antigua. We cooked at our hostel with food we had purchased from the local market, there is also a good supermarket “La Bodegona” close to the local market on “Poniente” which is very well stocked. Our favourite place to go out & eat was the local market, at 20 Q for 2 courses & a drink, it was an absolute bargain & was the most delicious Guatemalan food that we had. Just wander into the back of the market behind the food stalls & you’ll find a few rows of food vendors with various set menus on offer. There are foods to suit every taste in Antigua, all of the restaurants are very close together so it’s easy to just have a wander around & choose whatever takes your fancy. We stayed at MATIOX HOSTEL this is one of the coolest hostels we have stayed at. All of the rooms are grouped around a central courtyard making it super social but not a party hostel so still gives you the opportunity to get those z’ds in! The hostel also features a small bar, a hot tub, a fully equipped kitchen & has the most helpful staff who will sort any tours & bus bookings for you. We loved our stay there & would highly recommend, the only thing we would say if you are at all claustrophobic is to request an open bunk, we stayed in some really cool looking pod-style bunks which looked like fun but felt very stuffy at night. We had an awesome time in Antigua, it’s a great place to explore, party if you wish or just to take some time to chill & not do an awful lot at all. Have any questions for us? Have you been & have anything at all to add? Please tell us in the comments! Pin for me for later! 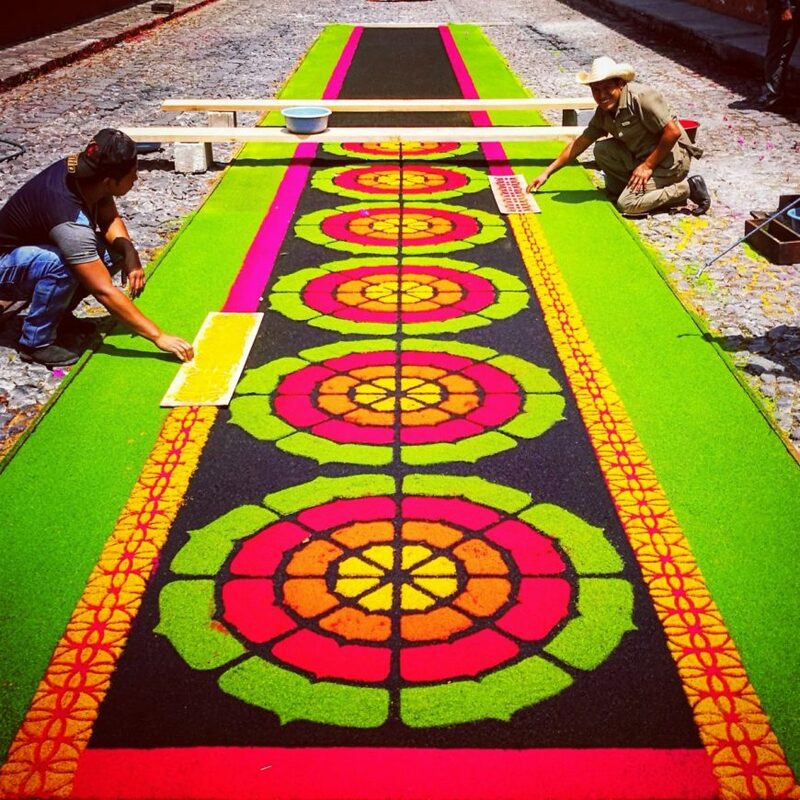 This entry was posted in Guatemala and tagged Antigua, What To See. Such good suggestions! That crumbling old church is so beautiful and fascinating! And of course you know I loved reading about where you ate! I love y’alls travel tips posts! 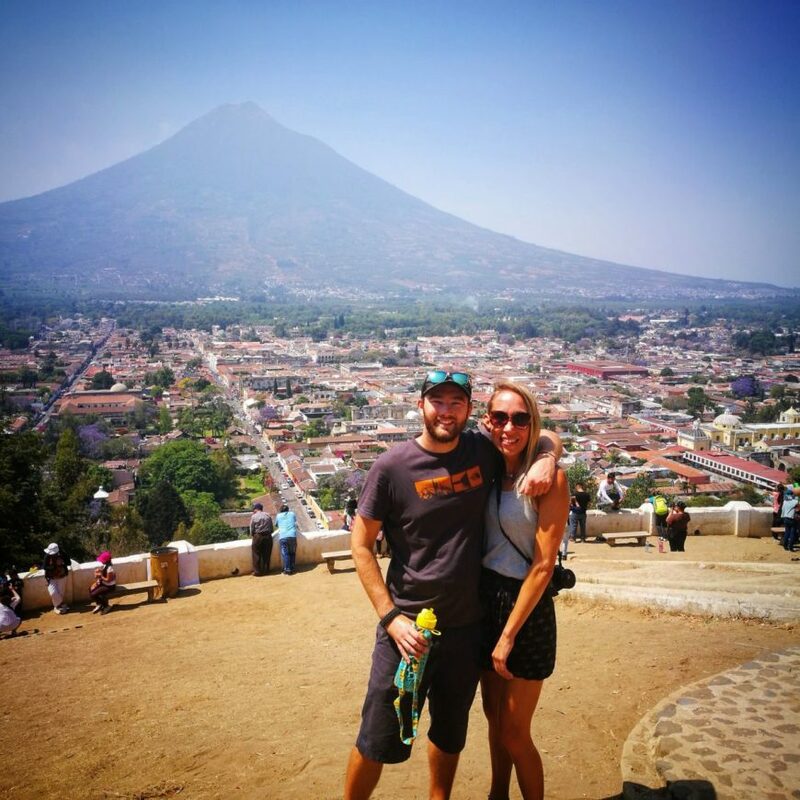 Thanks so much Stef, so happy you enjoyed it, you guys would love Antigua especially as there is also the Volcan de Acatenango hike to do nearby too! Thanks for reading ??? ?